Bread Knife Polypropylene Black - Spyderco, Inc. 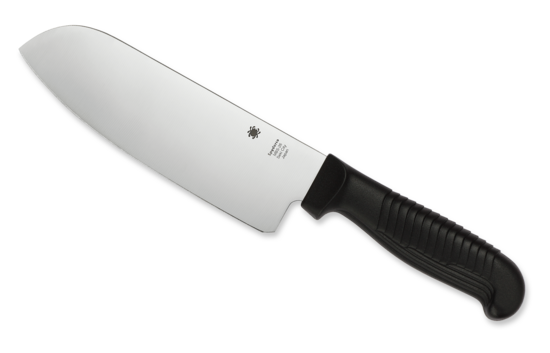 Page 1010 – Spyderco, Inc.
Few kitchen cutting chores challenge a serrated edge more than cutting bread—especially soft, freshly baked bread. Spyderco’s all-new K01 Bread Knife redefines the breed by combining our time-tested original design with more than 40 years of hard-earned experience and in-depth research and development of serrated edges. The K01’s exceptionally thin blade is crafted from corrosion-resistant MBS-26 stainless steel and expertly heat treated to yield a superior combination of sharpness, edge retention, and flexibility. It features a highly refined serration pattern that cuts soft breads and cake without crushing or tearing, yet is still capable of powering through hard-crusted baked goods almost effortlessly. The exceptionally long blade adds to the knife’s cutting power and control, supporting clean, precise push or pull cuts with equal ease. To ensure a secure, comfortable grip and construction that will stand the test of time, the K01features an ergonomic, textured polypropylene handle with a stepped texture that is injection molded directly onto the tang.